The Caithness Archaeological Trust aims to re-engage the people of Caithness with their heritage and cultural roots in a positive way, not only as spectators but as active participants in the development and conservation of an increasingly threatened cultural resource. 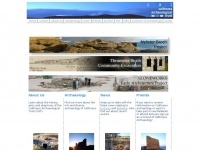 Keywords: Caithness Archaeology Projects Participation Culture Heritage. The web server used by Caithnessarchaeology.org.uk is run by Former Redbus Core Network and located in Great Britain. 18 other websites are located on this web server. Most of them are provided in the english language. The websites of Caithnessarchaeology.org.uk are served by a Zeus server. The HTML pages were created with the latest standard HTML 5. Both the inclusion of the website in search engines and follwoing of its hyperlinks is explicitly allowed.